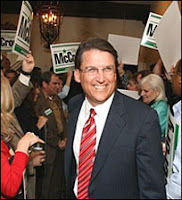 RALEIGH—Mayor Pat McCrory will address grassroots Republicans at the 2009 NCGOP Convention to be held from June 12-14 at the Raleigh Convention Center. Mayor McCrory will kick off the convention by speaking to delegates at the top of the first business session on Friday afternoon. He will deliver an address entitled "The Road to Victory." For a full schedule of events for the 2009 NCGOP Convention, click here. "I am extremely excited to have the mayor of my hometown and a good friend addressing the 2009 NCGOP Convention. As a highly effective mayor and visionary leader, Pat McCrory is just the right person to help North Carolina grassroots Republicans set a course for the future. Pat is the kind of leader that makes fellow Republicans proud to be on his team. It will be an honor to have him with us for our convention." Putting conservative princples into principled action! Join us!